In Daniel 12: 2-3 speaking of the final resurrection, we learn that the saints of God, in their resurrected bodies, “shall shine as the brightness of the firmament…” God’s image restored, compare, (Matt.17:2, Matt.13:43) with (1 John 3:2). He had dominion over all of God’s creation (Ps. 8:5-6). 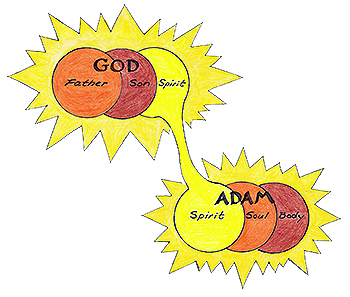 Adam was in union with God through the faculties of his spirit which enabled him to commune with his Creator. “And the LORD God commanded the man, saying, Of every tree of the garden thou mayest freely eat: But of the tree of the knowledge of good and evil, thou shalt not eat of it: for in the day that thou eatest thereof thou shalt surely die.” (Gen. 2:16-17). Notice “in that day…thou shalt surely die”. Adam & Eve didn’t die “physically” at that moment; they died a spiritual death. When Adam and Eve exercised their God-given free will to disobey, a crucial change occurred. A split second after the creature chose to defy his Creator an inward fatality occurred. 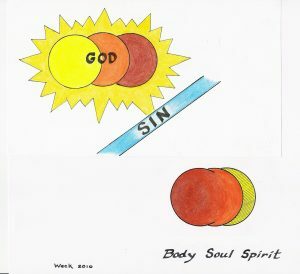 Adam and Eve’s spiritual union with God was the first casualty of their disobedience; the departure of the Holy Spirit from their spirit rendered them spiritually dead, separated from God. 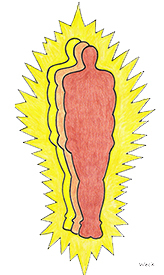 Upon the departure of the Holy Spirit, the garment of light loses its source (Illustration on the left) and Adam and Eve immediately become aware of their nakedness. (Gen. 3:7). Lost is the image and likeness of God in the sense that it is now marred and disfigured by sin…like a beautiful bird without its feathers. Also, notice the soul is now joined to the body as depicted by the illustration above right. Sin broke the bond between Adam and his Creator…Adam is now a carnal being, a “natural man” (1 Cor. 2:14) with a “fleshly mind” (Col. 2:18, 21, Rom. 8:7). A creature of light now dwells in a body of darkness. The void created by the departure of the Holy Spirit was filled by an independent, rebellious, self-centered spirit “…the spirit of disobedience” (Eph. 2:2, James 4:5). “Wherefore, as by one man sin entered into the world, and death by sin; and so death passed upon all men, for that all have sinned.” (Rom. 5:12) “…in Adam all die…” (1 Cor.15:22). This accounts for O.T. verses (prior to the second birth) where the soul is spoken of as the body, (Lev. 5:1-2 & 22:6, Gen.12:13, Ps.119:25). So, “Adam, which was the son of God” (Luke 3:38), created to be the king over God’s creation is now spiritually dead, separated from God and attached to an earthly body of corrupt and dying flesh. Had not God in His mercy intervened by providing temporal atonement through the shed blood of animals, and future permanent atonement through the precious blood of “the Lamb of God” Adam and all his descendants would have been eternally doomed. As we have seen, before the fall Adam was in a state of innocence…his spirit was joined to God’s Spirit, therefore fellowship with God was intimate and unobstructed. After Adam sinned all that changed…in a split second his spirit was severed from the Holy Spirit (Gen. 3:7). From that point on Adam and Eve were separated from God. They no longer desired to walk with God and hid from Him (Gen. 3:8). This act of disobedience ended what is referred to as the “Dispensation of Innocence” and began the “Dispensation of Conscience” (we will define dispensations further on in our study). The LORD then demonstrated His mercy and love for Adam and Eve by shedding the blood of innocent animals to cover their sin and nakedness. (Gen.3:21). After the fall God established a substitutionary system; temporary atonement, (Gen. 4:3-4) enabling His fallen creation to have conditional fellowship with Him. During this probationary dispensation, the Spirit of God spoke directly to man’s conscience, once again providing an opportunity for obedience…man could be right with God if he so desired. Unfortunately, only a small minority chose to submit and “walk with God” (Gen. 5:23, Gen. 6:9). It wasn’t long before man manifested his inherited sin nature when, “Cain rose up against Abel his brother, and slew him.” (Gen. 4:8). Genesis 6:5 sums up the result of man’s opportunity to led by his conscience, “And God saw that the wickedness of man was great in the earth, and that every imagination of the thoughts of his heart was only evil continually. And it repented the LORD that he had made man on the earth, and it grieved him at his heart. And the LORD said, I will destroy man whom I have created from the face of the earth…” (Gen. 6:5-7). This malignant condition is the inward reality which plagues all Adam’s descendants, whom the word of God describes “lost” (2 Cor. 4:3)“blinded” (2 Cor. 4:4), “dead” (Eph. 2:1), “enemies” (Rom. 5:10), “Having the understanding darkened, being alienated from the life of God…” (Eph. 4:18). In our unregenerate state, blindness to the inner workings of sin in the flesh was natural…however, now that we are saved, ignorance concerning the inner struggle is no longer normal, nor is it acceptable to the Lord. Every child of God is obligated to, “…put off concerning the former conversation [manner of living] the old man, which is corrupt according to the deceitful lusts; And be renewed in the spirit of your mind; And that ye put on the new man, which after God is created in righteousness and true holiness.” (Eph. 4:22-24) [Emphasis mine]. Learning doctrinal truth is like building a structure…if the foundation is off, the whole building will be off. Sound doctrine begins with a sound interpretation of the basics…only then can we follow God’s order and sequence, “For precept must be upon precept, precept upon precept: line upon line, line upon line; here a little, and there a little…” (Isa. 28:10). Now that we have explored the fundamental truths regarding the total effects of the fall, spirit, soul, and body we can proceed to analyze the details of salvation concerning the same. 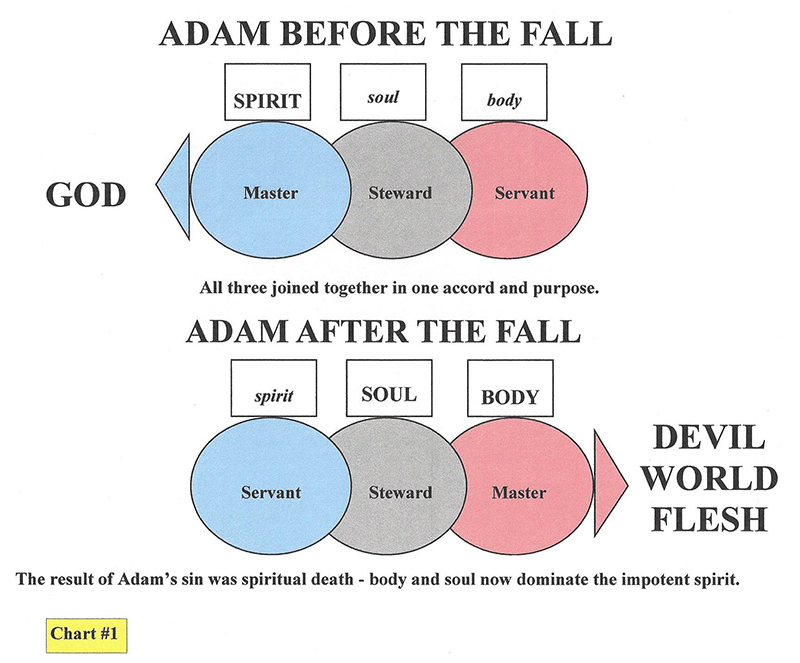 A complete understanding of salvation and the resulting reversal of the effects of Adam’s sin, spirit, soul and body (made possible by the death of the “last Adam”) will provide crucial insight; revealing the essential truths necessary to overcome our enemies and “walk in newness of life.” Ignorance or neglect regarding the life-changing doctrines associated with spiritual regeneration is a major component contributing to carnality within the Body of Christ, past, and present.